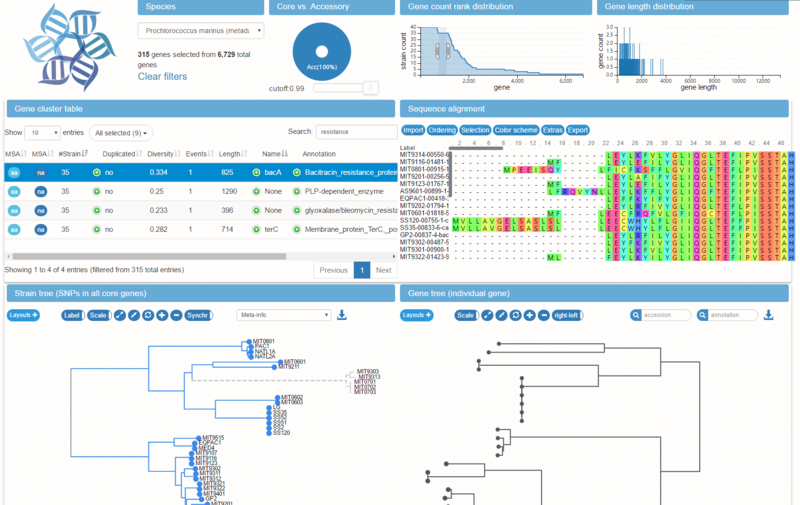 panX is a software package for comprehensive analysis, interactive visualization and dynamic exploration of bacterial pan-genomes. The analysis pipeline is based on DIAMOND, MCL and phylogeny-aware post-processing. The visualization application encompasses various interconnected components (statistical charts, gene cluster table, alignment, comparative phylogenies, metadata). Gene clusters can be rapidly searched and filtered by summary statistics such as annotation and phylogenetic properties such as diversity. Metadata and gene presence/absence patterns can be mapped onto the species tree. Such mapping facilitates the identification of genes associated with phenotypes such as antibiotic resistance, virulence, or epidemiological parameters such as host age. Logo and website © 2016 Wei Ding. All rights reserved. About panXpanX is a powerful interactive platform for pan-genome analysis and exploration. It provides multiple different views on annotated genomes and allows rapid search by gene name, diversity, gene gain and loss event, etc. Strain-specific meta-data is integrated into the phylogenetic tree viewer such that associations between gene presence and phenotypes (resistance,virulence,etc) can be easily spotted. Comments, suggestions for improvements, bug reports etc are welcome.